Originally uploaded by oh it's amanda. Peanut butter cupcakes, peanut buttercream icing, grape jam in the middle. I love peanut butter and jelly...sandwiches, that is. 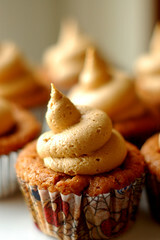 I don't know what I think about the idea of a PB&J cupcake, but my rule is, don't knock it till you've tried it. Actually, I have tried one, from Buttercup and it was okay but I think I prefer more traditional flavors. To me, though, the great thing about cupcakes is their seemingly infinite variety and our own unique flavor choices and way of eating them. To each their own cupcake! I've personally tried one of these, made by "oh it's amanda", and HOLY GEEZ they good. This "Buttercup" place must not be using the right stuff.